ClearSpan buildings are a fast, economical solution for municipal storage solutions. With decades of experience with governments and municipalities, ClearSpan understands the process and provides the most competitive bids and comprehensive designs. These structures can be constructed quickly, allowing local governments to recoup any lost time on their bidding process. 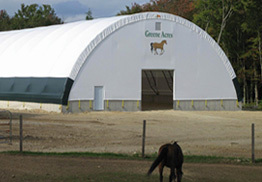 ClearSpan public works buildings create an ideal storage space for equipment, machinery and vehicles of all kinds. They provide plenty of clearance that is suitable for even the tallest equipment. 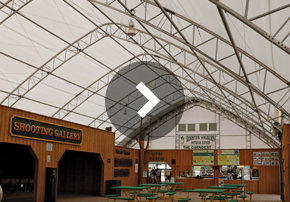 ClearSpan buildings utilize a sturdy frame that doesn’t require internal support posts, so each customer gets the maximum amount of storage and work space that ensures equipment and vehicles can be easily maneuvered within the structure. ClearSpan carries stock, turnkey and custom-designed buildings, so every municipal storage need can be met. Designs are available up to 300′ wide and can be built to any length, so structures can accommodate even the largest fleets. Buildings can be clad in fabric, metal or hybrid – a combination of metal and fabric. No matter how a town or city plans on using their structure, ClearSpan has an ideal option. ClearSpan’s advanced tension buildings are made with the very best quality steel and engineered truss designs. They are covered with ultra-durable materials that ensure a long life. ClearSpan Truss Arch Specialists have years of experience working with municipalities, making obtaining a ClearSpan building a simple process from concept to completion. ClearSpan storage facilities provide piece of mind, and customers can rest assured that their vehicles and equipment are safe and protected. Our public works buildings come in fabric, hybrid and metal buildings, ensuring that no matter how you plan on using your ClearSpan structure, there is an ideal option.